Reverse osmosis purification improves both the taste and quality of your water. It removed up to 99.9% of the chlorine, as well as objectionable odors and sediment. Reverse osmosis water filtration also removed the following hard water contaminants that may be present in your water: lead, copper, barium, chromium, mercury, sodium, cadmium, fluoride, nitrite, nitrate, selenium, aluminum, arsenic, sulfate, calcium, phosphate, iron, magnesium, zinc, chloride, silicate, cyanide, sulfate, bacteria, potassium, nickel, silver, bicarbonate, manganese, and ammonium. Get unlimited... pure, fresh, delicious drinking water right at home for drinking, cooking, ice, coffee, tea, juices, baby-formula, pet, beauty washing, dietary, medical uses, and plants watering. Reverse Osmosis water = 0.03¢/gal. You save $ 0.97/gal. Reverse osmosis technology to deliver the great tasting water you deserve at a price you can afford! Makes great water for drinking, cooking, juices, ice machines, baby formula, batteries, aquariums, low sodium diets, coffee, tea and much, much, more. 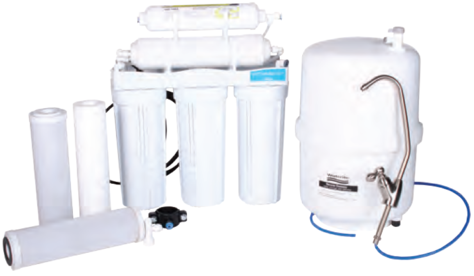 These same systems sell retail over $1,000 by your local water dealers. This New 5-Stage System comes complete and ready to install under your sink. > 1 year limited warranty! >>>>>>> Himalayan Healing Salt Lamp Buy 2, Get 1 FREE!